I’ve been following the tattoo news recently and I keep noticing a trend more conservative newspapers keep writing articles about how with the job market the way it is more & more people are getting there tattoos removed. That just doesn’t make sense to me, if you ran a business and the world economy was crashing wouldn’t you hire the best possible to work for you regardless of there tattoos? What’s weird about these news sites talking about tattoo removal growing is they all have such disdain for tattoos in general. At the end of the day the same people who dislike tattoos on there employees before the economic meltdown are the same people using that as an excuse not to higher you now. 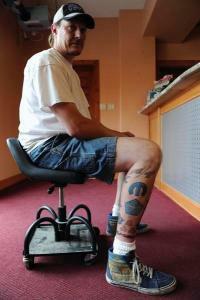 The picture that has accompanied goes with this article about a man who has a leg full of Chrysler tattoos.